Contains the list of both the active and inactive projects and allows you to review their status, edit the characteristics, assign tasks, check all of the time records and add more projects. 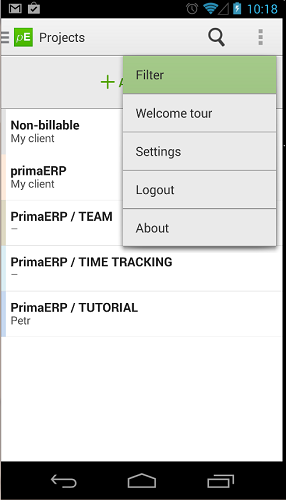 You can open it on the slide-out menu; just slide from the left or click on the top-left icon, and select the option "Projects". Filter the active and inactive projects: Allows displaying the active (in process) or inactive (completed) projects. a. Open the slide-out menu, by sliding from the left or clicking on the top-left icon. b. Select the option "Project" and you will see the list of your projects. located at the top-right corner of the screen. d. Select the option "Filter". 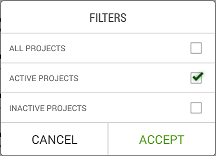 e. The filter option will be opened, allowing you to select whether to display the active projects, the Inactive projects or both. 2. Reviewing the project information: Allows you to have an overview of the project status and its characteristics. b. 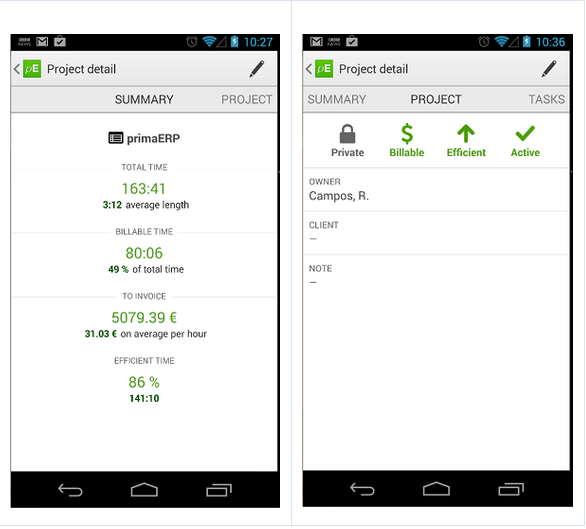 Select the option "Projects" and you will see the list of your projects. c. Touch the project of which you wish to check the status of. 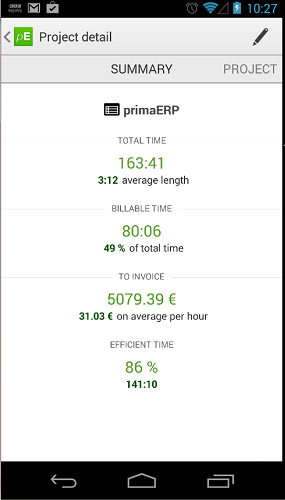 Summary: You can see the total hours tracked and the money earned. Project details: You can see the project characteristics. 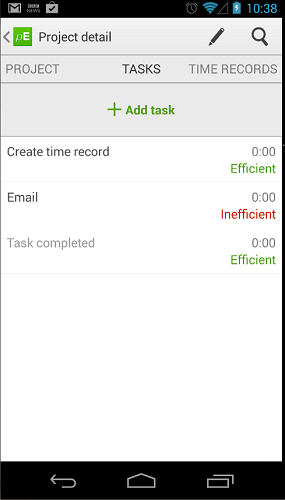 Tasks: You will see all tasks and will be able to add more if necessary. Time records: You will see the time records related to the project. 3. Editing a project: Here you are able to change the project details. c. Touch the project you wish to edit. to open the edit panel. Here you can change the project details. button to save the changes. 4. 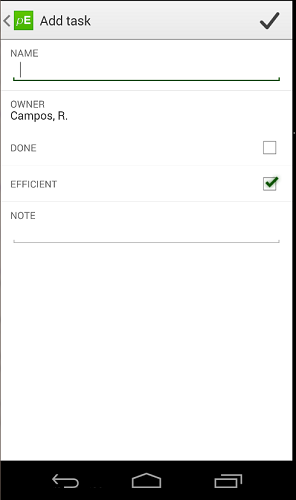 Project tasks: Users are going to be able to check the assigned tasks and edit them or add more. c. Touch the project of which you wish to review the task of. 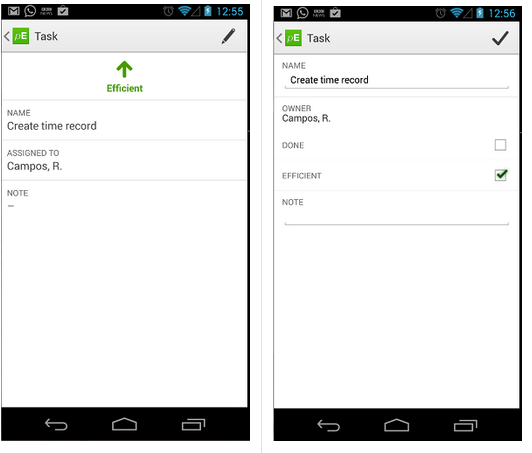 I: Add a new task: Simply touch the option “+ Add task” and fill in the task information. Edit the data and save it by pressing on the button. * Note that while editing, you can also mark the task as a complete, by checking the DONE checkbox. b. Create a new time record. Note that the data is going to be filled in according to the selected task. 5. 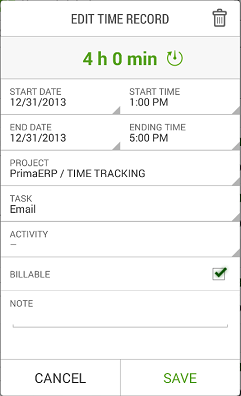 Project time records: In this section it’s possible to review all the time records up to date. a. Open the slide-out menu, sliding from the left or clicking in the top-left icon. b. Select the option Project, and you will see the list of projects. c. Touch the project you wish to review the time records of. d. Once you are in, slide the screen until the time records panel appears. 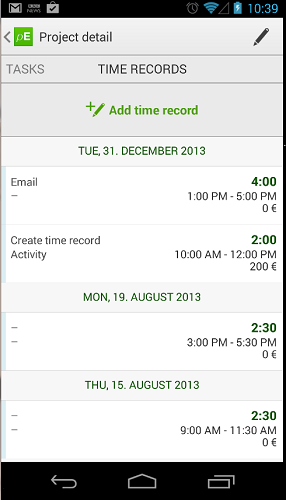 I: Add a new time record: Simply Touch the option “+ Add time record” and complete the Time record information. Touch the time record to be edited. You will see the full time record details. Proceed with the changes you want to make. III: Open the quick action tools: By Touching and holding a time record, the quick action tool will open, allowing you to edit, create a time record or start a new stopwatch. The data it’s going to be populated according to the selected time record. 6. Adding a new project: Here you can also add projects as needed. a. Open it on the slide-out menu, sliding from the left or clicking in the top-left icon. b. Select the option Project, you will see the list of projects. c. Touch the option “+ Add project”. d. Complete the project information and press in the ✔ button to save.